I must’ve walked past Laneway Greens half a dozen times by now, yet I’ve never thought to actually stop and take a look at it. I guess I just assumed, based on the tiny space (with no kitchen in sight) and the clean, fresh interior, that it’s some kind of juice or smoothie shop. With that said though, I was at least partially right. 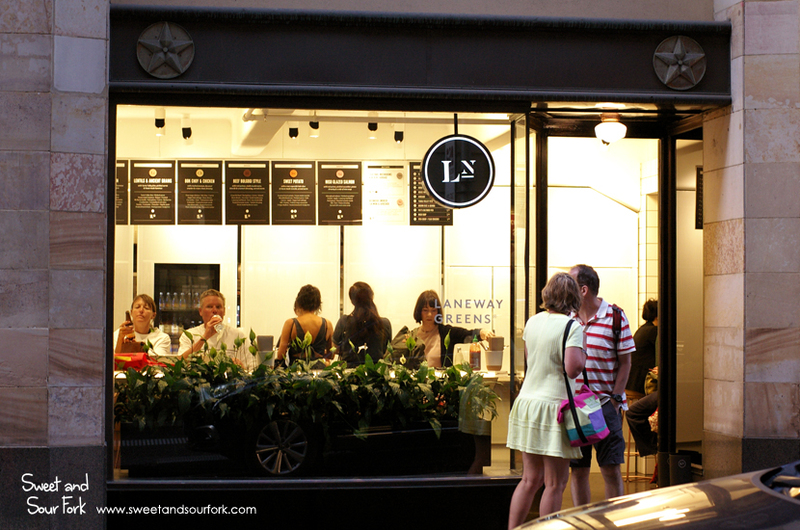 But Laneway Greens does so much more than just smoothies and juices. 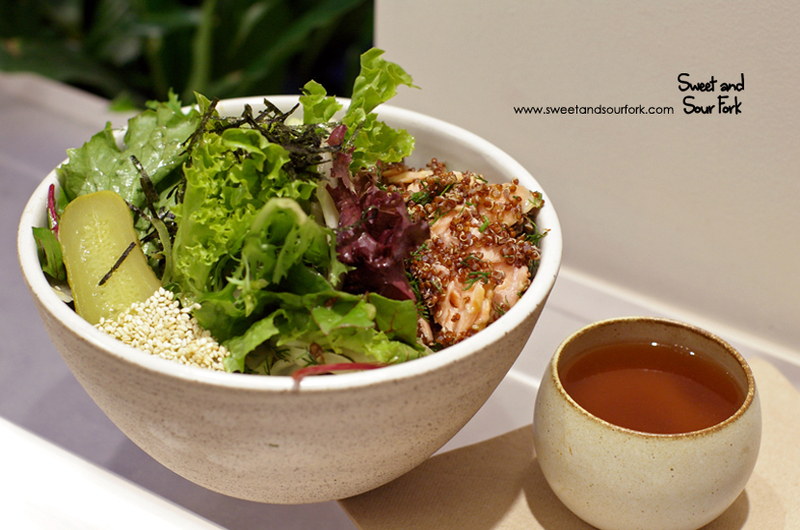 They also specialise in huge, delicious bowls filled with fresh, seasonal ingredients in tantalising combinations. And as it turns out, the kitchen is cleverly hidden behind screens, with a window that opens up to pass the food through. I was initially afraid that everything on the menu would be vegan – it’d been a couple days since I’d had meat, and I was craving the protein – but I needn’t have worried. The Beef Bulgogi Style ($16.5) came with huge chunks of deliciously smoky slow-cooked beef, drizzled with a sweet and spicy bulgogi sauce. Accompanying the beef was a myriad of fresh veggies and kimchi, served on a bed of red quinoa. 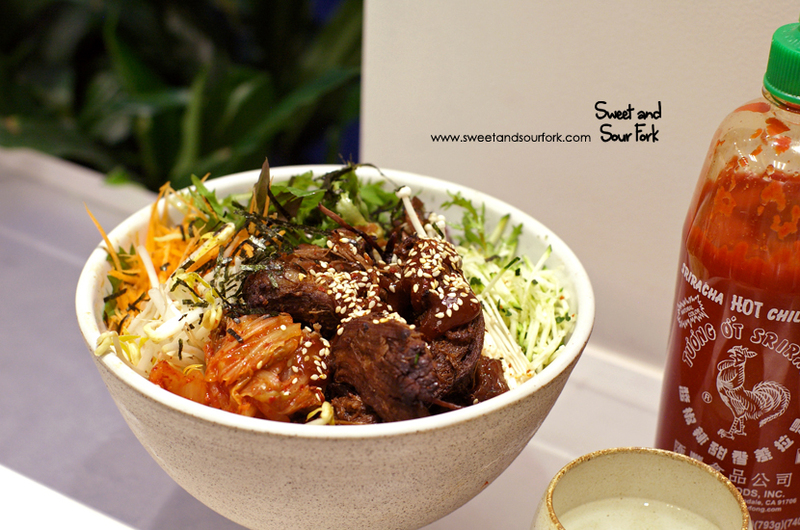 I thought this was absolutely delectable – like a healthy bibimbap that doesn’t skimp on the flavour. The Miso Glazed Salmon ($16.5) was a lighter, but no less tasty option. The salmon was incredibly soft and flaky, mixed through with a subtle miso paste and the warm anise flavour of dill. It was served on a green salad dressed in tangy ponzu; I especially liked the addition of apple slices and fennel – it gave the salad some welcome crunch and variation in flavour, without succumbing to the predictability of cabbage. Served with the salad was a cup of really, really great miso soup, its flavour complex and umami enough to rival any high-end Japanese restaurant. I have to admit, I am a little in love with Laneway Greens. It’s pretty much the perfect meal, in the sense that not only do you get something healthy and nourishing, it also packs oodles of flavour. In fact, this is the first time I’ve ever found myself legitimately jealous of Chris for his city job. 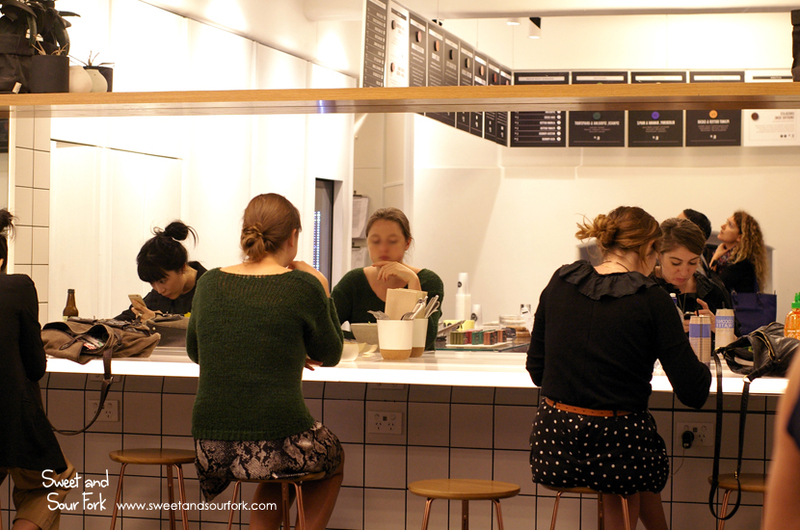 I’ve already promised myself a return trip in the near future to try out their matcha smoothie bowl. Rating: 15/20 – healthy is not a chore. Yeah so less than a week later (4 days to be precise), I’m back for the smoothie bowls after a very light dinner. The Matcha Green Tea Smoothie Bowl ($12.5) boasts a fruity base made with pear, banana and almond milk, and tasted of clean, fresh matcha. 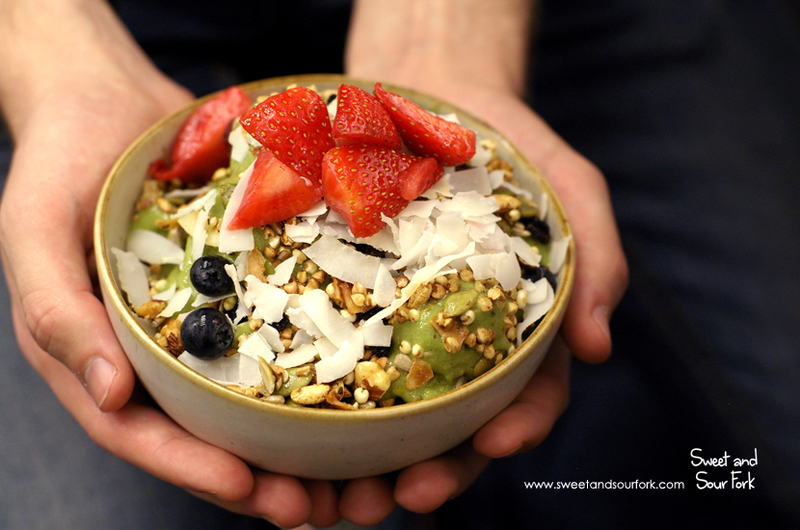 It was topped with fresh berries, shredded coconut, and crunchy almond and buckini (that’s activated buckwheat to you) granola for a total cornucopia of flavours and textures. This was equal parts wholesome and delicious, and was basically the stuff of my healthy dessert dreams. The seasonal Chocolate Smoothie Bowl ($12.5) on the other hand is all of the sin with none of the guilt. The combination of Dutch cocoa, peanut butter, and pure maple made for a base that’s possibly even better than chocolate gelato. 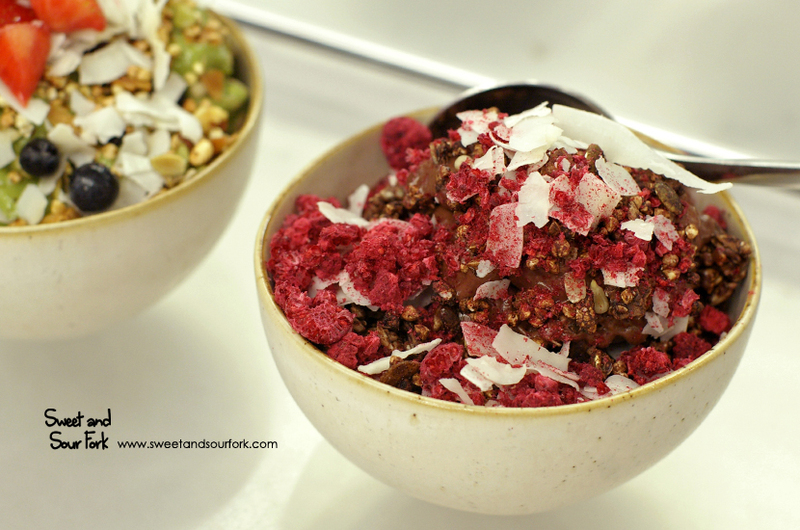 And instead of sprinkles, this bowl is topped with moreishly crunchy dark cocoa granola, and tangy freeze-dried raspberries. It honestly feels like eating a huge chocolate sundae, except this one’s actually good for you!